Even though laptops cost less than ever before, your best bet when looking for cheap computers is to stick with a desktop PC. Usually it costs far less to build your own PC than buy one off the shelf, but the price difference is negligible when talking about budget computers. Before you start, the inevitable question is about whether you need a desktop computer or a portable laptop. Each person’s needs are different, so read this to figure out if you should get a desktop or a laptop computer. Going by the comments on Amazon and other sites, the words “desktop computer” make buyers expect to get a PC that’s ready to go—with a monitor, keyboard, mouse, and the works. It’s a rude shock to open the box and not find a monitor or any other peripherals. So please note, desktop computers don’t include monitors or peripherals. Some common extras you may need to buy include an LCD monitor, keyboard, mouse, an optical drive, and a Wi-Fi dongle or adapter. If you’re building your own PC, chances are you will need to buy Windows 10 too, which can be a big chunk of your budget. In this article, if any recommendation is likely to have some hidden or extra costs, we will note it accordingly. Your search for a cheap desktop computer will always lead you to a mini PC. There are plenty of options below $ 200, but you should steer clear of them. The best cheap mini PC to buy off the shelf is the Minix NEO Z83-4, so start there. 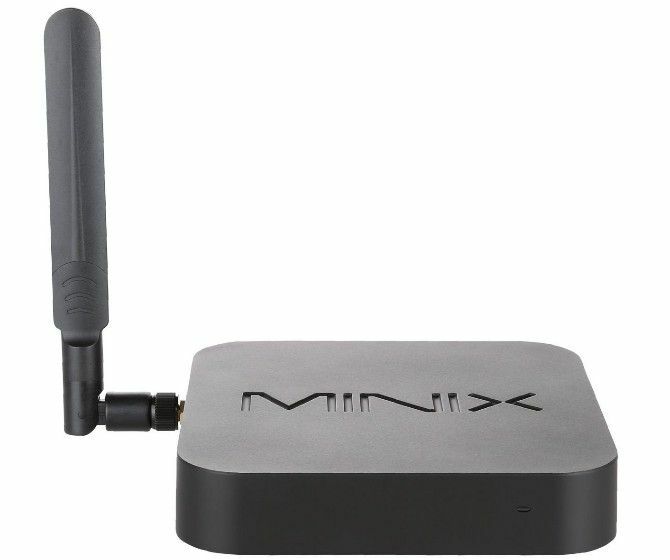 Minix isn’t a well-known brand, but this product is recommended strongly by both customers as well as seasoned tech reviewers. It does the little things right, like having a good design that dissipates heat well even without a fan. Minix has even thrown in a VESA mount so you can attach the entire PC to the back of your monitor, freeing up space on your desk. The limitations are obvious. Windows 10 takes up most of the 32GB of storage, so you’ll need an external hard drive with it, or use online storage drives. The processor is also not the best you’ve seen. It gets the job done for common tasks, but don’t ask too much of it. And the box can’t be opened to upgrade parts. Hey, at this budget, you expect some sacrifices. 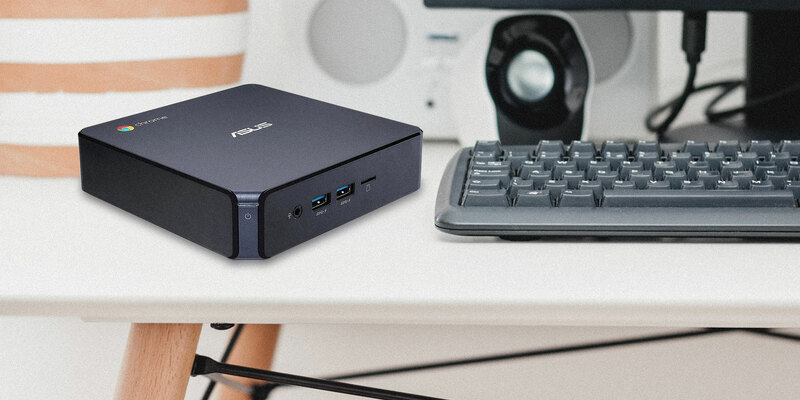 There are other excellent mini PCs you can pay more for, but if you’re looking for the “cheapest but good enough” option, then the Minix NEO Z83-4 is the one to buy. Note: If you’re looking to buy this for business or office use, the Minix NEO Z83-4 Pro gives you a Windows 10 Pro license for an extra 20 bucks. Apart from that, the two devices are identical. If you don’t need Windows 10 Pro, stick with the regular NEO Z83-4. 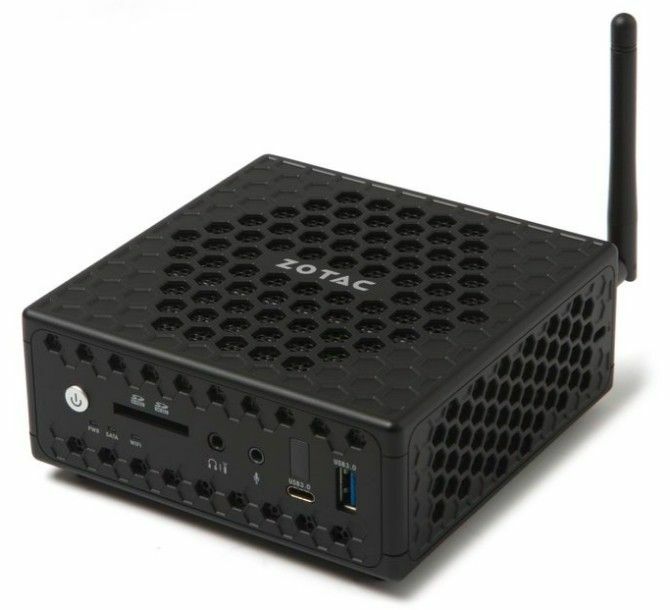 There is very little to set apart the Zotac Zbox CI325 nano from the Minix NEO Z83-4. At first glance, it’s not worth the extra $ 70, but there are a few compelling features. The big differentiator is that the Zotac Zbox CI325 nano is easy to upgrade. You can open the Zbox to find neat slots to add a fast 2.5-inch SSD for extra storage. There’s also an additional memory slot to upgrade the limited 4GB RAM. These are nice touches, since the Intel Celeron N3160 can benefit from the extra RAM while multi-tasking. But upgrades aside, there isn’t much else here. Sure, the Intel Celeron processor outperforms its Atom sibling, and the overall build quality of the Zotac Zbox CI325 nano is a bit better. Are these worth $ 70 more though? That’s up to you. 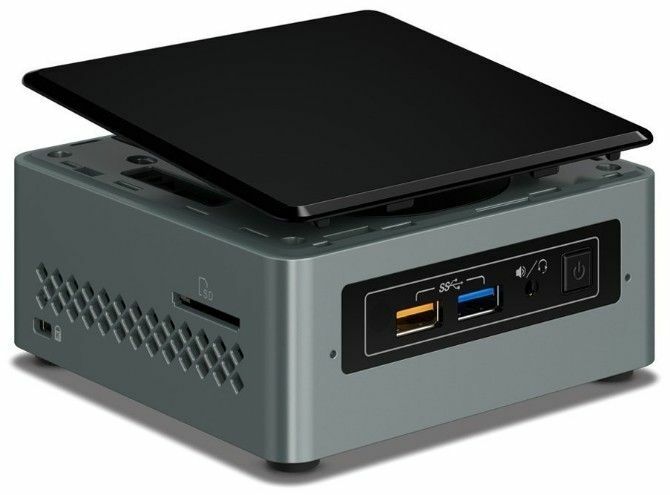 Intel’s Next Unit of Computing (NUC) mini PCs have become a favorite of reviewers, modders, DIY experts, and anyone who likes a desktop PC in a small form factor. There is a wide range of specifications available in this same tiny box. You should want one too. The NUC6CAYH model is powered by the quad-core Intel Celeron J3455 processor, one of the better low-powered CPUs Intel has produced over the years. If that’s not enough, the combinations available on Amazon let you go from the basic 4GB RAM + 1TB HDD up to 8GB RAM + 512GB SSD. Choose the combination that best fits your budget. In my opinion, the 4GB+1TB HDD, 8GB+1TB HDD, and 8GB+256GB SSD are the best value for money. Once you’ve picked your combo, you only need to hook up this PC to any monitor, keyboard, and mouse to start using it. Windows 10 is pre-installed, and the hardware is decent enough for most home and office tasks. 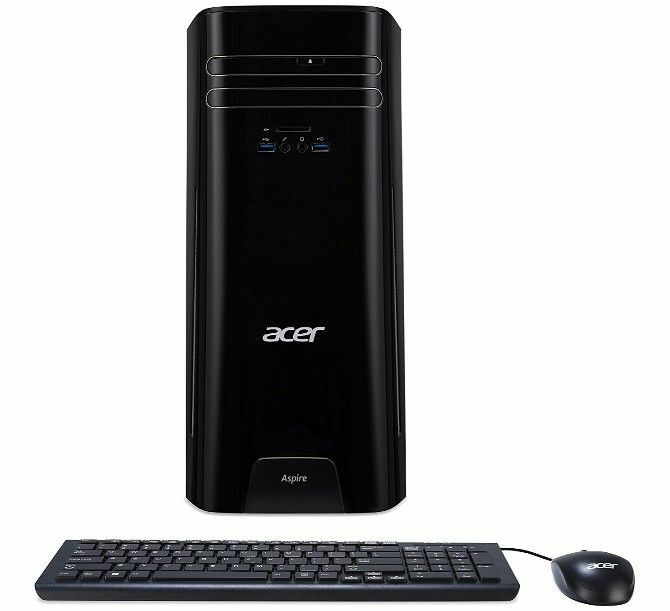 The Acer Aspire TC-780 Desktop perfectly fits the needs of anyone looking to buy a desktop computer with as little hassle as possible. It includes everything that someone in a home, home office, or small office would need. One of those features is the integrated support for 802.11ac Wi-Fi. Wi-Fi support isn’t even common on several motherboards for budget PC builders yet, so it’s nice to see that Asus has bundled it rather than making you buy a Wi-Fi adapter or card. The processor isn’t the best possible at this price range, but when coupled with the 8GB of RAM, it’s good enough to handle those whose needs are browsing the internet, email, MS Office, and some light multimedia. Overall, the TC-780 makes sure there aren’t hidden costs. You get a computer, you get the mouse and keyboard with it, and you aren’t spending on extras like a Wi-Fi dongle or a copy of Microsoft Windows 10. Simply attach it to a monitor and you’re ready to go. Microsoft Windows ends up inflating the price of several small PCs. 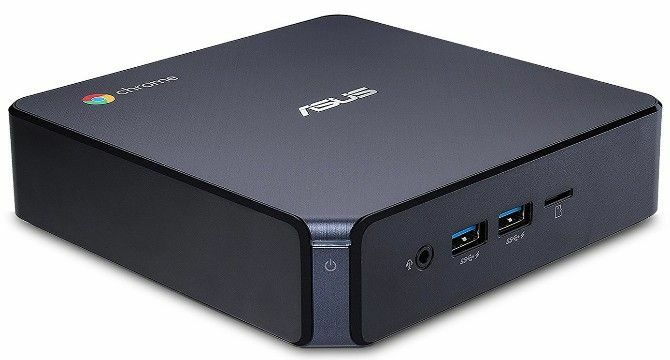 If you’re ready to ditch Windows and go with Google’s free operating system, then the Asus Chromebox 3 is an excellent mini PC with Chrome OS. The hook of this device is that Chrome OS runs better on such low-powered hardware. The Intel Celeron 3865U processor and 4GB of RAM would struggle with Windows, but Chrome OS is smooth with the same specifications. Unlike Chrome PCs in the past, the Asus Chromebox 3 supports Google Play Store, which means you can install essential Android apps on Chrome OS. The device will also support Crostini, the new Chrome OS update that lets users install Linux programs. Given what you can install, the 32GB of storage will be insufficient. You will want to add some extra storage space by using one of those three USB ports. The most surprising thing about this article is the lack of “build it yourself” PC options. Generally, those work out cheaper than buying a pre-assembled computer. Trust me, I was as shocked as you were to find that for budget PCs like these, it’s cheaper to buy readymade units. The big reason behind this is Windows 10. Microsoft sells Windows 10 for around $ 100, but manufacturers like Zotac and Acer save on this cost by buying licenses in bulk. When the margins are so small, Windows is the difference, making it cheaper to buy than build a PC in this case.